Paint your door – If your front door is looking a little worse for wear (or is a little outdated, stylistically speaking), consider repainting it. Use a color that compliments the rest of your home but that also establishes it as a focal point of your entryway. Add a mirror – A mirror in the entryway allows buyers makes it easy for them to picture themselves living in your home since it allows them to physically see themselves there! Not to mention that mirrors help to make smaller entryways feel bigger as well. Add plants – Adding plants to the entryway makes the transition from outside to inside more natural. Plants also help to create a more relaxing atmosphere that will put buyers at ease. Flowers are also a good option and will have a similar effect. Add a place to sit – A bench or a chair helps to make an entryway feel less formal, which will help make buyers feel more comfortable. Add a lamp – If you don’t have a lamp in the entryway, set one up. Overhead lights are generally a little too harsh, whereas lamps help provide a warm glow that gives off a more cozy feeling in the evenings. 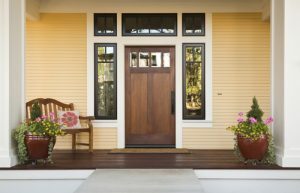 Use these tips to make your entryway feel more comfortable and inviting to create a stronger first impression on buyers.